If, like me, you play as a Night Elf or a Forsaken, you lost something in the lead up to Battle for Azeroth. Now, as the Forsaken have pushed into Darkshore to execute their Dark Lady’s vision of Kalimdor as a Horde continent, the Night Elves are mounting a counterattack looking to push the invaders out of their ancestral lands once and for all. Ion Hazzikostas revealed the existence of the Battle for Darkshore Warfront during today’s livestream which revealed details about patch 8.1. Like the current Arathi Warfront, this one starts out with one faction in definitive control of the zone — but this time it’s the Horde. The Forsaken have pushed hard into Darkshore as part of the offensive that kicked off the pre-expansion event, and they hold the land… for now. 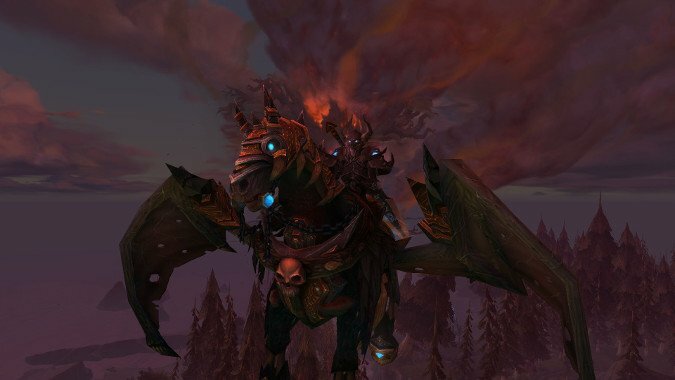 Alliance will have the chance to do turn-in quests to flip the zone and pay the Horde back for their burning of Teldrassil in much the same way that the Horde did in Arathi. The Warfront will have all the usual features, with a complete max level redesign of Darkshore, a World Boss for whichever faction controls the zone, and various rares to kill for Azerite and possible loot, pets, and mounts. However, a notable difference will be that we’re going to see Night Elf and Forsaken architecture and Warcraft 3-style buildings instead of the Orc and Human ones we see in Arathi. But to me, it’s the story focus on the conflict between the Night Elves and the Forsaken that’s the most interesting aspect of the new Warfront. I’ve said it before — one of the things I found galling about the burning of Teldrassil was that the primary reaction we got in game to it was the Horde’s. We got to see Saurfang’s orcpain over the dishonor. But I don’t care how the Horde feels about it — as a Night Elf player, I want to see the Night Elves respond to it. Ion’s mention of how Tyrande is playing into patch 8.1 makes me excited — I seriously hope she’s leading Alliance forces in this Warfront. More so than with Arathi, I feel like this is a Warfront with a real storyline to explore, and I’m glad we’re not just forgetting all about all that horror we saw in the pre-expansion. Similarly, if you’re Forsaken and you lost your home, you get to explore what your people have been up to in Darkshore. This is thanks to the fact that the Horde starts off the Warfront in control of the zone, and it’s primarily the Forsaken leading the Horde’s charge here. That’s a welcome change, in my opinion. We have an interesting conflict between the displaced and dispossessed Forsaken trying to conquer Darkshore while fighting off the Night Elves who themselves were displaced and dispossessed by the Forsaken. I guess I just care more about the story when it’s actually about the people most affected by the war. 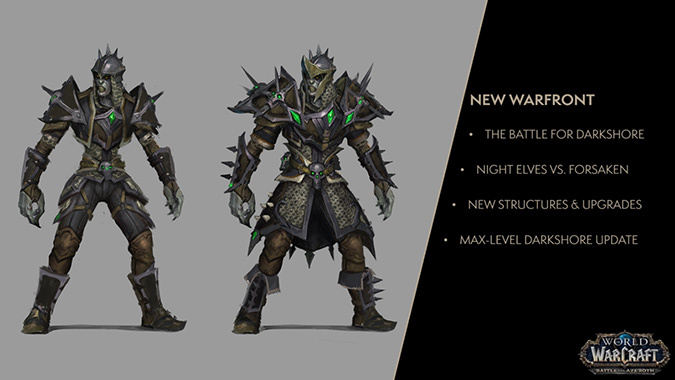 Patch 8.1 is slated to hit the PTR this week, so we’ll be able to log on and see what the next phase of the war looks like.